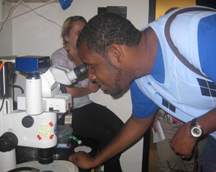 Each year teachers participate in local workshops where they learn about BioEYES, zebrafish, and where they meet with scientists in a laboratory setting. All teachers that are new to BioEYES are required to attend a training workshop, while multi-year teachers have the option to attend for a refresher and to learn new techniques. Our ultimate goal is to train teachers to deliver our programs independently, with materials loaned to them by the BioEYES host organization. How this works is that in year two, teachers may co-teach alongside a BioEYES outreach educator. By year three teachers may be ready to teach the unit autonomously as “model” or “master” teachers. All program materials are loaned to them, and support is offered to a teacher, regardless of level, on an ongoing basis. For more information about our teacher workshops, please contact your regional outreach educator. A basic understanding of normal human development is a critical prerequisite to the understanding of Science, Technology, Engineering, and Math (STEM) and STEM careers. With this in mind, the objective of the elementary experiment is to familiarize students with the life cycles of humans and fish (2nd grade), vertebrate habitats (4th/5th grade*), organs common to humans and fish (2nd and 4th/5th grades*), and different cell types (4th/5th grade*). Students raise zebrafish embryos and larvae to observe and discuss these topics. The middle school experiment deepens students’ understanding of the need for medical research as well as providing a model for inheritance. The students are asked a question such as: “If an albino female is mated with a wildtype (striped) male zebrafish, will the offspring be pigmented?” The students mate fish on day one, observe subsequent embryo development, and practice Punnett square activities to help find the answer to the research question. By the last day, students observe pigmented melanocytes and discuss their understanding of dominant and recessive genes. The high school biology and AP experiment addresses career opportunities in the biosciences and covers aspects of Mendelian genetics, with questions such as “Based on our F1 cross we expect that the phenotypic and genotypic ratio between wildtype to albino zebrafish will be ____?” Students raise offspring and observe development and skin pigmentation. The use of the Punnett square and more sophisticated aspects of genetics are also covered.